Officially 1/4 of the way to my eventual bartop! Today I sorted through my bottle caps and am officially 1/4 of the way to my eventual bartop! Yes, I have several friends who are happy to pass along their uniques, so I didn't personally drink all of these beers. Once I figured out what I was shooting for, that became an unrealistic expectation, no matter how many years it may take. 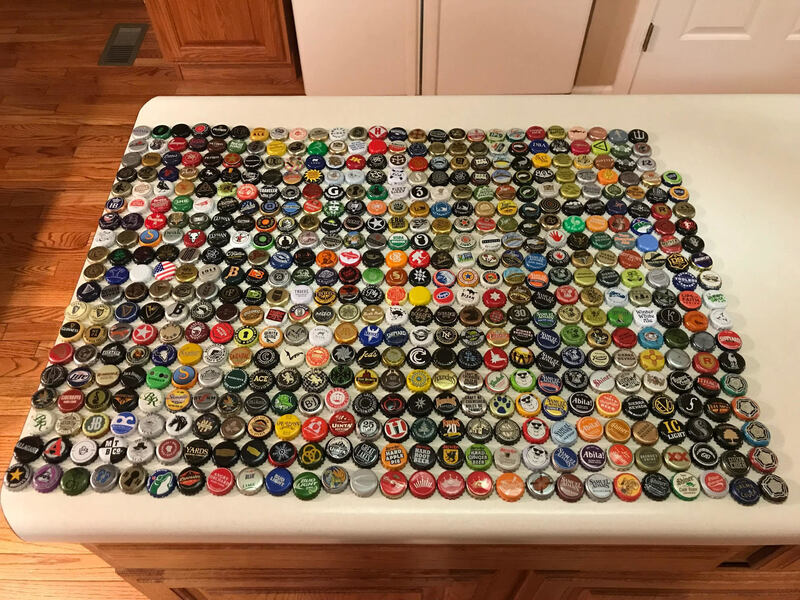 I still have to measure etc but at 510 uniques, I am roughly 1/4 of the way to my goal of 2k unique bottle caps. At this pace, by the time my kids no longer need the basement (our youngest just turned 2) I may actually be able to put together a pretty awesome one of a kind bartop. In case anyone has any duplicates they would be willing to part with, please shoot me a PM. Don’t settle for mediocrity... get drinkin’! For the record, THIS is what my goal is, with the unique qualitifaction being all caps unique. Well heck, I’ll save some unique caps and send them your way... that’s a noble cause! That is going to be an awesome bar. You won't be able to get your company to leave. Nice work and great idea! More and more companies can their beers now unfortunately. I'd help the cause by sending some as well. That bar top is gonna be awesome. Fantastic! Do you have a list of what you already have for those that might like to send you uniques? Sadly, I"m not quite that organized about my project, I take a picture of them laid out grouping breweries together once every 6 months or so and check on my phone when I pop a new bottle. If I don't see it, I toss it in my bin under the sink where I save them. I live in PA so most of em would only be those available locally here, although I'm always on the hunt when I'm on the road and have a few buddies who send me bags of theirs on occasion for me to sort through. Keep me in mind before you toss caps. Good Lord... That is a thing of beauty! Where are you in PA? I'm in York and I'm guessing most of our caps would be the same. I will go through mine and see if I can't find any for you. I'm just south of Pittsburgh. If you get down here again, I just tried Insurrection last weekend. Fantastic beer. It's over in Carnegie.